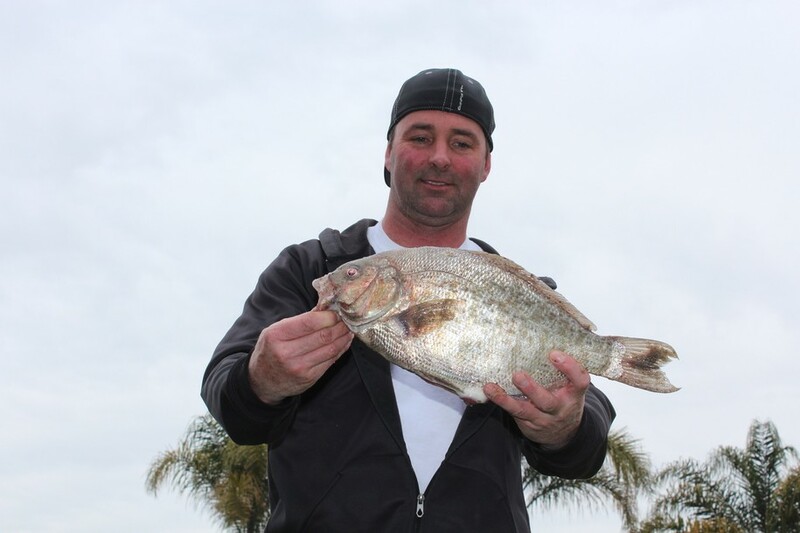 Steve Griffin of Marina shows off his three-pound, 5.5-ounce barred perch measuring caught off Monterey on March 10. Photo by DAN BACHER, Fish Sniffer Staff. Steve Griffin of Marina won the grand master trophy in the fourteenth annual Sand Crab Classic Perch Tournament in Santa Cruz on March 10 by catching a three-pound, 5.5-ounce barred perch measuring 16 5/8 inches long. The fish is the largest perch of any kind caught in the popular grassroots event, a fundraiser for the Monterey Bay Salmon and Trout Project. 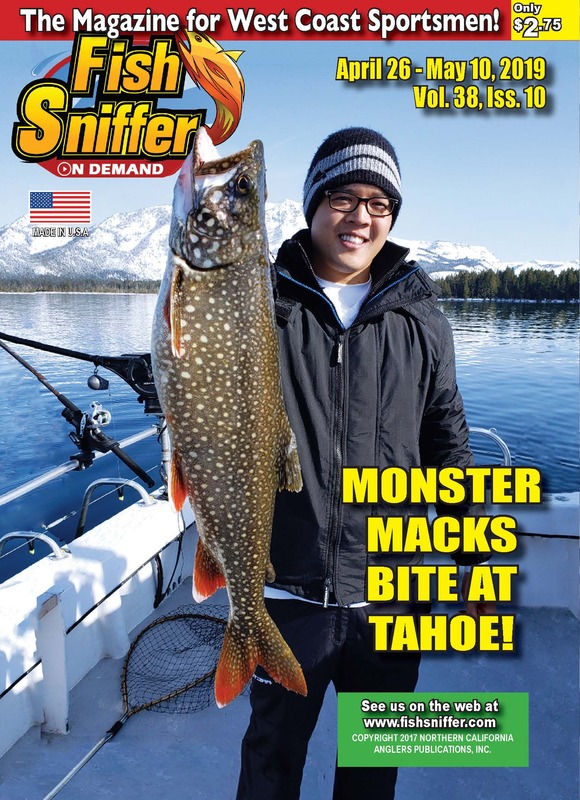 I love covering this popular grass roots event, one of the most fun events in the world of California fishing. More than 300 people participated in the event that drew surf fishing enthusiasts from Stockton, Modesto, San Jose, the San Francisco Bay Area and Monterey Bay cities including Monterey, Marina, Watsonville and Santa Cruz. The seas were flat calm with no wind and no swell; many anglers reported slow fishing because of it. The fundraiser takes place in the perch capitol of the world, Monterey Bay where the most diverse array of surfperch species is found. 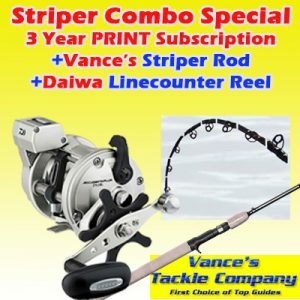 For example, during the first Sand Crab Classic in Santa Cruz in January of 2005, I counted seven varieties of perch – shiner, barred, rubberlipped, black, striped, rainbow and walleye – caught off the Santa Cruz Municipal Wharf alone. Phil Cabato won first place in the senior seaperch division with a two-pound, four-ounce red tail perch measuring 14 5/8 inches caught off San Gregorio. Cabato, from San Mateo, was fishing with other member of the Cast Addicts, including J Rey, J.V. Philip, James, Nick, Khan and Nick. Dave Modena placed second in the senior seaperch division with his two-pound, .2-ounce redtail perch measuring 14 5/8 inches caught off Half Moon Bay. Matt Michie placed third with a one-pound, 14.3-ounce striped perch landed off Monterey. 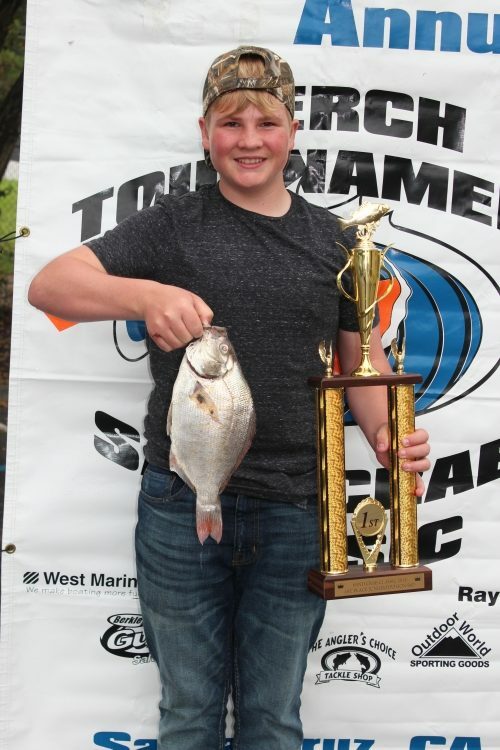 Dangelo Gipson took first in the senior barred surfperch division with a two-pound, 3.2-ounce fish measuring 14 inches taken off Santa Cruz. John Bartoh placed second in the senior barred perch division with his 1-pound, 13.8-ounce fish measuring 14.25 inches caught off Capitola. Chayne Baydo placed third with his one-pound, 13.6 oz. perch landed off Rio Del Mara. Ken Oda won the barred perch on a fly division with his one-pound, 13.3-ounce fish measuring 13 5/8 inches caught off Sunset Beach. Richard Gilliam placed second with his 12 7/8-inch perch caught and released off Sunset Beach also. Likewise, Thomas Andrade finished third with his 12-1/2inch perch hooked and released off Sunset Beach. 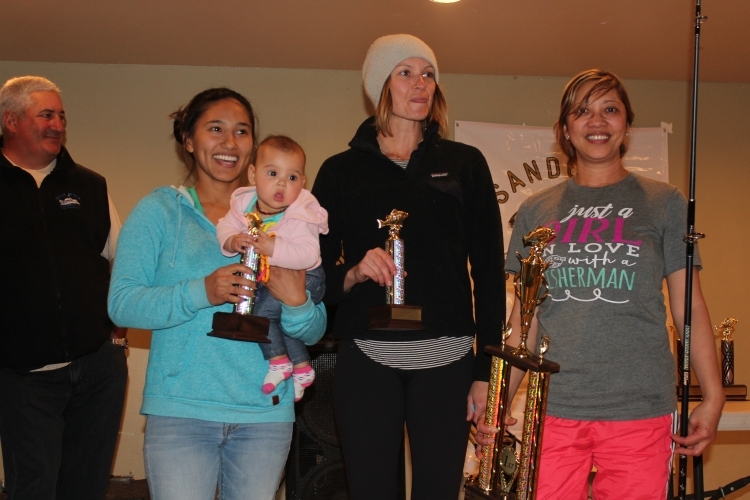 Amy Padua placed first in the women’s sea perch division with a one-pound, 5.1-ounce calico perch measuring 12-1/4 inches taken off the Santa Cruz Lighthouse. Krista Outtes placed second in the womens’ seaperch division with a 12.3-oz redtail perch taken off San Gregorio. Mariah Garcia placed third with a 5.8 oz shiner perch taken off Santa Cruz. Leslie Cadwalladen captured first in the women’s barred surfperch division with a one-pound, 2.2 ounce beauty measuring 12 1/8 inches taken off Sunset Beach. Corrina Outten placed second in the women’s barred perch division with a 13.8-ounce fish measuring 11-3/8 inches long taken off Sunset Beach. Grace Balmonte finished third with a 13.6-ounce perch measuring 15-5/8 inches long landed off Pomponio Beach. Emiko Ancheta of Richmond won first place in the junior barred perch division by bagging a one-pound, 7.7-ounce fish measuring 13 1/8 inches off Rio Del Mar. She was fishing with her granddad, Albert, from Stockton, and her dad, Anthony Anchetta. Olivia Shallenberger placed second with a one-pound, 5.3-ounce perch measuring 13 inches. She only divulged that she caught it “in the ocean.” Sebastian H. finished third with a one-pound, 4.3-ounce fish landed off West Cliffs Drive in Santa Cruz. Julian Renz took first in the junior sea perch division by catching a one-pound, 13.10-ounce redtail perch measuring 13 7/8 inches off Rio Del Mar. The exotic species division of the event has featured everything from a leopard shark to a boat sewage tank reeled in during the Tsunami of 2011. This year the exotic entries included a 20 lb. bat ray caught and released by Zach Donnelly and an emperor sandcrab landed by Tyler. However, it was Nelson Borges who, in addition to landing a one-pound, 4.8-ounce perch, brought in a bikini bottom, winning the category by acclamation from applause he received. During the barbecued lunch, I sat next to Bob Aoichi from Morgan Hill who had been perch fishing with his family. The last time I saw him was at Lyons Reservoir on the Stanislaus River in spring of 2003 as I was leaving with a limit of trout and one catfish. Amazingly, I had just seen the same angler at the Coyote Bait and Tackle Bass Tournament and Anderson Reservoir two weeks before I saw him at Lyons. Mike Baxter MC’d the event, with Tom Zizzo serving as the “Vanna White” of the awards ceremonies. “We raised $5,000 for the Monterey Bay Salmon and Trout Project last year – and we hope to raise another $5,000 this year,” said Baxter. 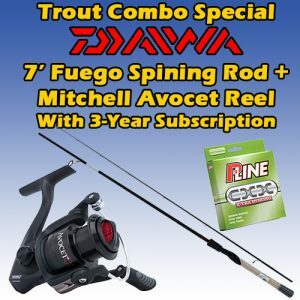 Winning anglers receive trophies and rod/reel combinations for the events, but not cash prizes. The winners in the women’s seaperch division – Mariah Garcia, Krista Outen and Amy Padua – pose with their trophies at the awards ceremony. Photo by DAN BACHER, Fish Sniffer Staff. 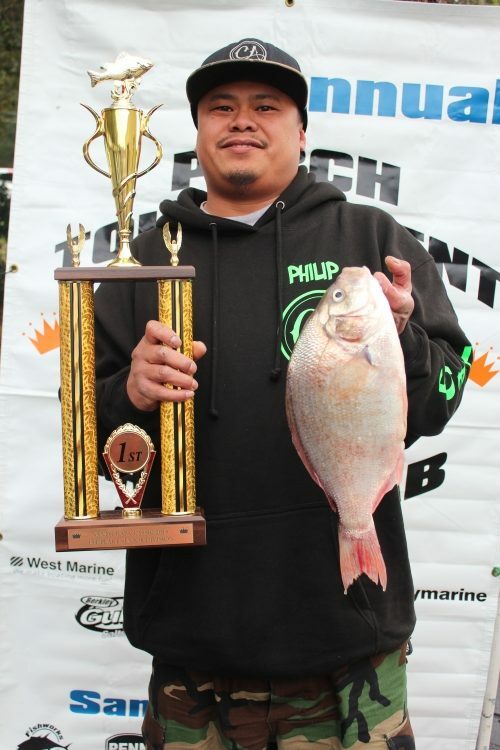 The perch tournament is held the second Saturday of March out of Santa Cruz every year. The event helps fund the Monterey Bay Salmon and Trout Project (MBSTP) a model conservation organization that has been working to restore and enhance native steelhead and salmon populations in the greater Monterey Bay region since 1976. The event is limited to the first 300 entries – and they sell out each year. In January, MBSTP hatchery staff and volunteers participated in a coho salmon spawning day at the Kingfisher Flat Genetic Conservation Hatchery. On these days, mature female coho salmon are netted from rearing pools and checked for spawn-readiness using an ultrasound machine. Those fish found to be ‘ripe’ are spawned, and their eggs are mixed with viable milt from on-site male broodstock. Allen Bushnell is the co-organizer of the event with Mike Baxter. Both are hosts of the Let’s Go Fishing Radio Show on 1080 AM Radio in Santa Cruz. The entry fee is $40.00 for adults and $30.00 for juniors (under 16 years old). Meal only tickets are available at the door for $10.00. I have participated in every Sand Crab Classic since the first one was held in January 2015. It is the only event of its kind in California – and I applaud Mike Baxter, Allen Bushnell and the many sponsors of the event for doing the hard work every year to make this derby happen! Julian Renz won first place in the junior sea perch division by catching a one-pound, 13.10-ounce redtail perch measuring 13 7/8 inches off Rio Del Mar.